Mendelson's Memos: Review: War Horse (2011) is pure, unapologetic old-school melodrama. Review: War Horse (2011) is pure, unapologetic old-school melodrama. It would almost be lazy to say that War Horse is 'the kind of movie they just don't make anymore', but it would also be explicitly accurate. It is a grand, sweeping melodrama complete with wide vistas, long takes, and soaring music that is intended to stir the soul. It is a simple tale that happens to take place during complicated times, and it touches upon the tragedy of its era while remaining focused on its core narrative, which is the journey of its title character. More than any other movie since Peter Jackson's King Kong, Steven Spielberg's War Horse is arguably operates as a textbook example of what 'going to the movies' is supposed to mean. But unlike so many recent odes to cinema or genre homages in the last few years, War Horse is an 'original' story (albeit adapted from a novel and a play) that stands on its own four hoofs. It is a flawed film, and much of its emotional impact depends on the viewer's affinity for horses. But when it's cooking, it's a pure, unadulterated MOVIE in the best sense of the word. At its simplest core, the story of War Horse concerns a boy and his horse. The film opens as Ted Narracott (Peter Mullen) overpays for an impressive stallion and now faces financial ruin unless he can train this horse to plow a seemingly impossible field. But when the task falls to his young son Albert (Jeremy Irvine), the young man and his new horse form a seemingly unbreakable bond. Alas, through unfortunate circumstances, the horse finds himself embroiled in what became known as The Great War, as he ends up 'fighting' on both sides on the conflict and irrevocably touching the lives of everyone he comes in contact with. The second and third acts of the film take place in and around the bloody conflict, as a generation of young men find themselves in the hell of battle and the horse finds himself struggling to survive. The first act is arguably the strongest, as it remains tightly focused on the Narracott family and their struggles to pay overdue rent to a relatively unsympathetic landlord (David Thewliss, doing his best to infuse a mustache-twirling villain with token depth). The remainder of the film inevitably feels episodic, as the horse finds himself in the care of several different characters over the course of the war. Some of these tales are more dramatically effective than others, and I will only say that Niels Arestrup shines brightest in a sea of what frankly amounts to a series of extended cameos (Tom Hiddleston, Emily Watson, Benedict Cumberbatch, and Eddie Marsan are among those who pop up just long enough to be noticed). How much you become engaged in these stories will partially depend on how much you like horses. If you're the sort who is in awe of 'these magnificent beasts' and is able to relate to the struggles on an animal, then you're frankly going to be welling up far more often than someone who doesn't have any special affinity for horses. I was personally more moved at how 'Joey' motivated those around him to occasionally commit acts of unexpected kindness during a time of astonishing cruelty. Where Spielberg shines brightest is in the big bold strokes of this epic picture. He successfully details the horrors of World War I and the arbitrary carnage it wrought without blood or gore, although animal lovers should be warned that we do see dead horses when the narrative demands it. Spielberg focuses on the confusion and terror that this 'first modern war' brought about, and implicitly condemns the conflict by refusing to explain why it even occurred (we are only told via announcement that "England is at war with Germany!"). While the British side comes off just a touch better than the Germans, Spielberg plays no favorites and takes no sides in what is arguably one of history's stupidest wars. At the very least, this violent but mostly bloodless epic will serve as a history lesson for younger audiences about what is perhaps becoming another 'forgotten war'. Alas, the film stumbles a bit by indulging in a bit of needless 'yellow-highlighting'. John Williams's appropriately epic score is used to highlight every minor emotional beat to the point where it almost becomes comical. It also stops dead in its tracks at several moments so that characters can look almost directly in the camera and intone just how awesome the stallion really is. Quite frankly, despite constant assurances that this particular horse is indeed special, we see little evidence that he is different from any other horse. We are supposed to believe that Joey and Albert share a special bond and are supposed to hope for their eventual reunion, but I'm frankly not sure what was so special about Albert's training the horse to do back-breaking manual labor. In short, despite his declarations of love, Albert treats his horse no better than several of its temporary owners along the way. 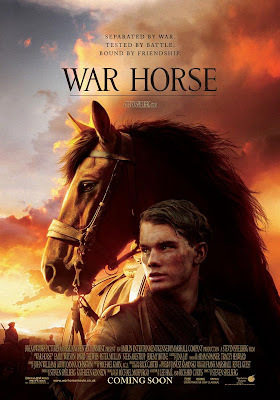 Despite these token misgivings, and the fact that I'm not 'into' horses, Steven Spielberg's War Horse works as a sweeping piece of melodrama that works best perhaps merely as an advertisement for actually seeing films in a theater. It is a huge and genuinely epic picture, full of fine character actors, gripping combat scenes, gorgeous European locations, and the sort of old-fashioned entertainment value that we should not take for granted. As a starting point for the third act of Steven Spielberg's incomparable career, it is a clear sign that he has no intention of fading into irrelevancy or resting on his laurels. Most filmmakers would distinguish themselves by making a movie this good. That it merely exists in the middle of Spielberg's filmography is a testament to his longevity. War Horse may miss out on being a great film. But it is unquestionably a great movie. Locations are all British, by the way, rather than 'European' - the entire film was shot in England. Just saw this movie today (12/27/2011) and agree with Scott Mendelson's reivew. A few things really bothered me beyond what is in this review. First, when Joey finally plows the field, it is done wrong. Fields are plowed across a hill, never up and down the hill. The reason is actually shown later in the movie but not really for the right reason. If you plow up and down a hill, when it rains, the water can run down the rows and ruin the crop, here though we are show the crops being ruined not because of how the field was plowed but only because the field flooded. This bothers me as if the family did this on their own it could be believable. But the whole town of villagers were watching them plow the field. None of them would have know the error? I think this is a fairly big oversight. It was done to show the horse could pull a plow up a hill. But it thumbs its nose at what is fairly basic agricultural know how and these were farmers. Another issue for me was the lighting in the film really bothered me at times. A lot of scenes had the sun behind the subjects and while it is common to light the subjects to improve the contrast, it seemed the color temperature of the lights was off a fair amount of the time; enough certainly to bother me. When there is a yellowish sun behind the subjects, I would not expect to see a much whiter light highlighting the subjects. Last, in one of the indoor barn scenes, the stone walls of the building just looked way to fake. Seemed to have been done in a way that would be similar to a high school production. Perhaps this all says something about the film that I nit-picked. If I had been thoroughly captivated by War Horse, perhaps I'd never had noticed these things. But as it is, I was just unsettled enough by the whole affair that I started picking it apart which is something I normally don't do with films. As Mr. Mendelson said, War Horse is a good movie, but I don't think it is a great film either. The hype has been much larger than what the movie actually is. It is not a bad film at all. But I have seen better this year, including another film that Spielberg had a hand in, which was Super 8. That movie is actually a film I'll watch a few more times. War Horse was most definitely a one-and-done affair for me. As a horse lover I really wanted to love this movie and dipped into a very tight budget to go to see it. Unfortunately I was hugely disappointed with this movie. I found it schmaltzy and over-wrought and often ridiculous. It was mystifying why each caretaker along the way immediately recognized the horse as exceptional - his life story and his intelligence, which none knew in full or at first glance, is what made him special, not the way he looked. For me this was particularly irritating in the case of the grandfather. Also, except for plowing the field and saving his friend from having to pull a cannon to his death (a bit of anthropomorphism that almost made me laugh), the horse really does nothing particularly heroic. It was the people who tried to spare him misery along the way who were heroic. The horse did what horses do - respond to kindness and try to survive. The episodic structure of the film added to my distaste. None - except perhaps the first - were allowed to develop well enough for me to understand why the people involved acted and felt as they did. They were brief - with no effort to suggest the passage of time beyond a day or two that may have justified the devotion the horse stirred in the characters - again especially the grandfather. I rarely have the opportunity to actually go out to a movie in a theater and sadly I feel that this one was miserably wasted. This movie was very disappointing to me also. Number one, the accents made alot of the dialogue unintelligible. Emma Watson was really wasted here. The young man who starred was adequate but far from compelling. I don't think this was a stallion.